New original musicals are my favorite thing, and a thing that's becoming more rare in the age of movie adaptations and jukebox musicals on Broadway. 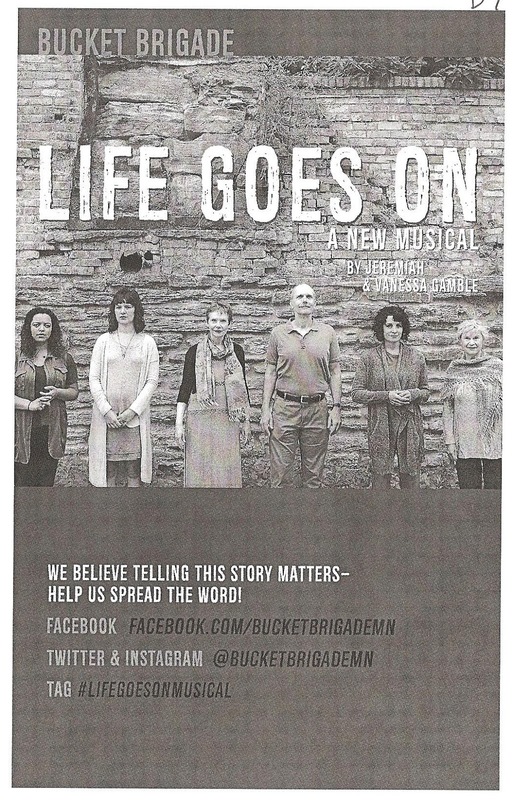 Fortunately we can look to #TCTheater for the remedy, including local company Bucket Brigade. 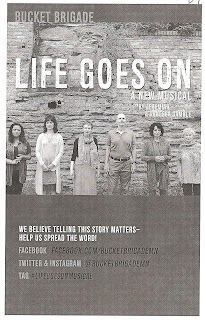 They seem to love new original musicals as much as I do; they've created several, the most recent being Life Goes On, now playing at the charming Art House North in St. Paul's West 7th neighborhood. It's a beautiful story of grief, forgiveness, connection, love, and family. Told in 90 minutes with a cast of six and a three-piece band in a former church space, it's an intimate experience that's engaging and moving, and if you've lost someone (who hasn't? ), could also be painful and/or cathartic. As I've been saying a lot lately, #bringtissues (maybe it's just me!) when you go to see this lovely and real new musical. Life Goes On is not an adaptation of my favorite TV show from the early '90s starring Patti LuPone (that's an adaptation I would approve of! ), rather it's the story of a family dealing with grief. One year after the unexpected death of their father, two adult daughters, who have been estranged since the funeral, come together at the home of their mother to mark the anniversary and figure out what to do with the ashes. Stacia (Vanessa Gamble, who co-wrote the music along with book and lyrics writer Jeremiah Gamble) is a trauma surgeon, and feels guilty that she couldn't predict her father's illness or prevent his death. She has withdrawn from the family and focused on her work as a way to deal with her grief. Her sister (Katie Consamus) is upset and hurt that she hasn't been around, and tries to heal the rift. Their mother (Janet Hanson) misses her husband terribly but is trying to move on with her life and is happy to have her girls home again. Making things more interesting is Dad's (played in flashbacks and memories by Bob Beverage) recently found birth mother, a Ukranian immigrant named Anya (Dee Noah), living at an assisted living facility under the care of aspiring nurse Sage (Falicia Cunningham). Stacia goes to meet Anya for the first time and discovers a lively spirit, a wise soul who helps her heal. These five very different women come together and find a connection, a way to help each other get through. Because life goes on. This is a sweet, simple, relatable story, and while part of me wanted to know more about the how/when/where of a young Anya giving her baby up for adoption, and how she and said baby ended up living in the same town in America some 60 years later, another part of me was glad of the ambiguity and the succinct 90-minute run time of the show. Not everything needs to be spelled out, and for this story these details aren't important. What's important is this unexpected family finding each other and helping each other at a time of need. The six-person cast is wonderful (where has Dee Noah been all my life?!) and they all work well together as a believable family unit under director Jeffrey S. Miller. Music Director and arranger Michael Pearce Donley leads the three-piece band (piano and two guitars in the side alcove) in this original score that spans several musical styles, including some Ukranian-sounding pieces. 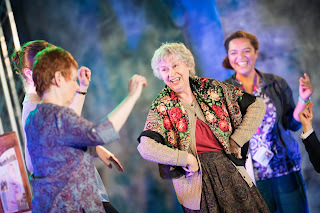 It's well-performed by the cast, no amplification needed in the intimate space of the former church. It's always kind of amazing what they can do with the small altar/stage space. 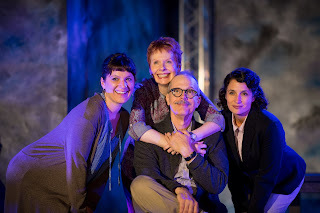 Here just a gray table and chairs, with props hidden in trunks on either side, with a neutral background against which lights play, abstractly create the entire world of the play (scenic design by Katie Phillips, lighting design by Courtney Schmitz). Life Goes On is a sweet little story filled with some simple but profound lessons about the joy and pain of life, being grateful for the moments we have, and the importance of sharing our stories. Continuing through October 13, with all tickets under $30.